Keep your candy canes and fruitcake. For me, Christmas cookies are a perennial diet-breaker. Nothing tastes better than a great cookie, and a great Christmas cookie reigns supreme over all pastry. This delicious holiday tradition goes all the way back to the Middle Ages when culinary ingredients such as ginger, cinnamon, and almonds first appeared in Europe. Certainly I will always be grateful to the first Dutch settlers for introducing Christmas cookies to America when they arrived in the early 17th century. So Dank U...and pass the Dutch almond cookies please. Meanwhile if you're in the mood for a little holiday baking, Meg and I offer up a few of our own Christmas cookie recipes. 1. Mix sugar, egg yolk, vanilla and butter. 3. Roll batter into little balls. Press with thumb to make indentation. 4. Spoon jelly in the center. 5. Bake at 375 degrees for 5-8 minutes on an ungreased cookie sheet. 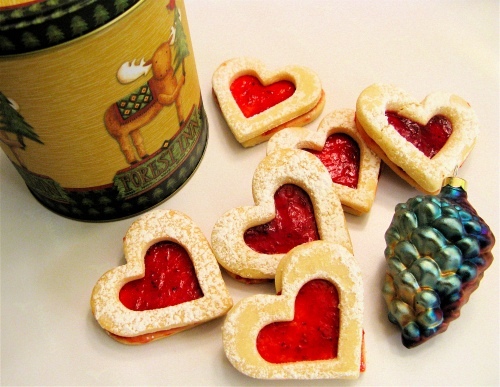 (These are one of my favorite cookies of all time, despite almost getting beaten up over them. When I was a child, my mother would bake what seemed like hundreds of different kinds of cookies for the holidays. She was very particular about storing the thumb print cookies correctly since she didn’t want the jam filling to stick to the other cookies in the container. 3. Fold in ¾ cup chopped pecans. 4. Chill dough. Roll into 1” balls. 5. Bake at 400 degrees for 10-12 minutes. *Immediately* place balls in 2 cups of confectioner’s sugar, 2-3 balls at a time, to coat. Let cool. Roll again in more confectioners’ sugar. Store in a tight container. 1. Sift together flour, baking powder & salt. 2. Beat 1 egg well, then slowly beat in sugar. 3. Blend oil, orange juice, almond extract & vanilla. Gradually beat into sugar mixture until well blended. 4. Beat in half the flour mixture until well blended, then mix in remaining flour mixture. 5. Shape into 1 inch balls and place on greased baking sheet. Flatten center of each cookie with thumb. 6. Beat remaining egg slightly. 7. Combine with water & brush generously over tops of cookies. 8. Press an almond into center of each cookie; brush again with egg mixture. 9. Bake at 375 degrees for 5-10 minutes, or until golden. Check cookie bottoms to avoid burning. Makes 3 dozen. 1. Cream 1 cup light brown sugar plus 1 cup EACH of Crisco shortening and butter (not margarine). 2. Add 1 box of yellow cake mix plus ½ cup flour, 4 eggs, 4 tsp vanilla, 1 tsp almond. 3. Add 8 oz. of candied fruit, plus 1-2 cups of either chopped pecans or walnuts. 4. Chill dough for several hours or overnight. 5. Drop onto parchment paper-covered cookie sheets. Bake at 350 degrees for 15 to 20 minutes. REST for two minutes before removing. Bake for only 10 minutes if you don’t use parchment. Slowly add milk to confectioner’s sugar into the consistency is smooth and thin enough to use a glaze over the cookies. 1. Sift the flour, baking powder, soda and salt together. 3. Blend in the egg, milk, and vanilla to the butter & sugar. 4. Add the dry ingredients. 5. Chill the dough in refrigerator for at least 2 hours. 6. Roll the dough out to 1/8 inch thick on a lightly floured board. 8. Bake on ungreased cookie sheet at 375 for 8-10 minutes. 9. 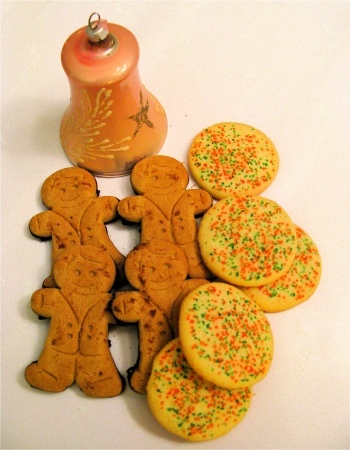 When cool, spread glaze over cookies, then sprinkle with colored sugar. Cut pastry ingredients together or mix with clean hands until pastry ball is formed. Chill before rolling out. Pat into bottom and sides of pastry tart pans. Melt butter. Add sugar, egg, vanilla to melted butter and mix. Fill pastry tarts only half-full, bake at 400 degrees for 12-13 minutes. Makes 6 dozen. 1. Preheat oven to 350. Lightly grease two baking sheets. 2. Combine flour, baking powder and salt. 3. In a large bowl, cream the shortening and sugar. 4. Beat in the eggs and vanilla extract. Gradually blend in the dry ingredients. 5. Combine the sugar and cinnamon in shallow dish. 6. Pinch off 1 inch pieces of dough and roll into balls. 7. Roll in the cinnamon sugar and place in 1 ½ inches apart on baking sheets. 8. Bake for 8-9 minutes, until lightly colored. 9. Transfer to wire racks to cool. Makes 5-6 dozen.